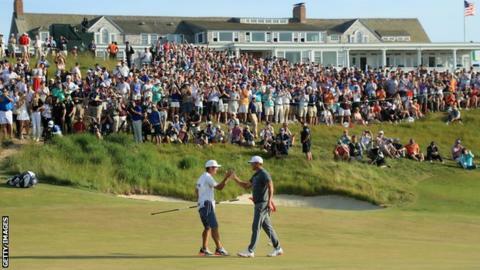 American Brooks Koepka retained his US Open title with a one-shot victory over England's record-equalling Tommy Fleetwood at Shinnecock Hills. Koepka, 28, closed with a two-under-par 68 to top the leaderboard at one over and deny Fleetwood a first major title. Fleetwood, 27, had set the clubhouse lead at two over after a scintillating seven-under-par 63 - the joint-lowest round in US Open history. World number one Dustin Johnson shot a 70 to finish third on three over. England's Justin Rose, who began the day one shot adrift of a four-way tie for the lead, finished tied for 10th on seven over after a three-over 73. The course was set up in a more favourable fashion for the final round after organisers had to apologise and admit they "went too far" with the layout as only three players broke par on Saturday. There were also calls for five-time major winner Phil Mickelson to be disqualified after he broke the rules during the third round. World number four Koepka, who claimed his first major at Erin Hills last year, became the first player to retain the US Open title since Curtis Strange won in 1988 and 1989. "This is incredible. I don't think I could have dreamed of going back-to-back. It's truly special and I am honoured," he said. "I always felt like I had a chance. I was never out of it. I just needed to keep grinding. I knew the conditions would ease up a bit and I took advantage of it." Fleetwood, who eclipsed his fourth place at last year's US Open, took full advantage of the favourable set-up at the course on Long Island in the state of New York. The world number 12 became the sixth golfer to shoot 63 in the US Open - joining Justin Thomas, Vijay Singh, Tom Weiskopf, Johnny Miller and Jack Nicklaus - and was one short of matching the all-time major record of 62 set by South Africa's Branden Grace during last year's Open Championship at Royal Birkdale. Miller, in 1973, and Fleetwood are the only players to card a 63 in the tournament's final round. He holed eight birdies, including a superb run of four on the trot in the middle of the back nine, but missed an eight-foot birdie putt on the last. Fleetwood then had to watch for more than two hours as the leaders completed their rounds. "A 62 was more on my mind than where I was in the tournament coming down the last few holes," said the 27-year-old from Southport. "It's special to shoot a 63 at the US Open. "I thought 62 after six or seven holes. I knew I had to shoot something good. Last night we said shoot the greatest score in a US Open and you'll have a chance. It's alright saying that but it never happens. "Just getting that close is the ultimate thing that I will take from this. It's nice as a golfer to have that hard work start paying off. Hopefully this is just one stage in me winning majors." Koepka equalled the US Open's lowest winning score of 16 under last year but the 28-year-old has been limited by a wrist injury. He missed The Masters at the start of April but returned later that month and played five events leading up to Shinnecock Hills. The world number nine started his title defence with a five-over 75 and was seven over after four holes of round two. But he recovered to post a four-under 66 before adding a 72 in round three to leave him tied for the lead with Johnson, Daniel Berger and Tony Finau. But with playing conditions for the final round considerably more favourable than Saturday's heavily criticised third round, Koepka was three under after five holes. He escaped with just a bogey on the par-three 11th despite hitting his tee shot long and then chipping across the green into a bunker, holing a 12-foot bogey putt. That kept the Floridian's momentum going after a birdie on the 10th and four successive pars followed before another birdie on the par-five 16th took him to level par and a two-shot lead. Koepka parred the 17th, allowing him the luxury of a final-hole bogey. Johnson, the 2016 US Open champion, birdied the last to knock Patrick Reed (68) into fourth. Masters champion Reed had birdied five of his first seven holes but three bogeys in four holes from the ninth halted his momentum and he dropped another shot on the 18th. Finau, playing in the final group with Berger, endured an up and down final round of 72, closing with a double bogey at the last which dropped the American back into sole possession of fifth at five over. Compatriot and playing partner Berger could only manage a three-over 73 to finish tied for sixth at six over with England's Tyrrell Hatton (69) and Henrik Stenson of Sweden (71). Ian Poulter, who was in a four-way tie for the lead after round one, finished off a disappointing weekend with a five-over 75 to end tied for 25th on 12 over. Mickelson's controversial week closed with a one-under 69 for a share of 48th at 16 over par. The 48-year-old, a six-time runner-up at the only major he is yet to win, celebrated wildly when he holed a par putt on the 13th, having been penalised two shots during the third round at that hole after deliberately stopping his ball from rolling off the green by hitting it back towards the hole.